Hey guys, did you have a nice holiday? That's nice. Guess what? There are a ton of shows to see again, starting tonight. So get out there. Local rapper Kid Sister makes an appearance at Berlin tonight while Al Scorch's annual holiday party shakes down at the Hideout. This weekend, Chicago institution the Waco Brothers play their annual Waco Weekend at Schubas, with headlining shows on Friday and Saturday. And Poi Dog Pondering play a sold-out, four-day run of shows at City Winery. And of course there's Macabre's Holiday of Horror party tonight. That and more after the jump. The Yuletide cheer doesn't have to end yet. Chicago's most metal holiday tradition is Macabre's annual Holiday of Horror party, which happens tonight. "The holiday season can make anyone feel a little bit murderous, which is why Macabre’s annual December party is such a welcome and necessary tradition," says Monica Kendrick. 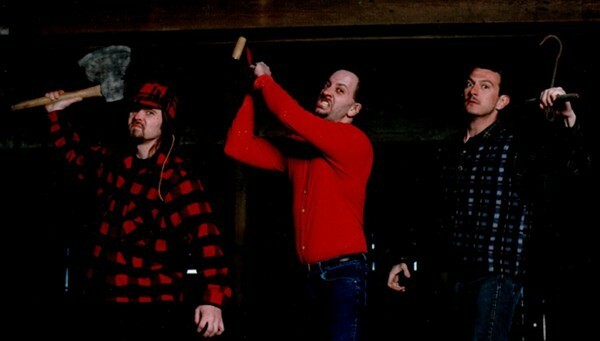 "This Chicago 'murder metal' trio—founded in 1984 and likely the world-record holder for longest-running metal band without a lineup change—specializes in songs about serial killers, and its Holiday of Horror show is always a sing-along spectacular of unfairly, grotesquely hooky killer tunes. This year the evening begins with a screening of John Borowski’s new documentary, Serial Killer Culture, which focuses on artists, writers, musicians, and filmmakers fascinated by humans who hunt other humans; the band features prominently in the film, alongside painter Joe Coleman, Serial Killer Coloring Book creator Rich Hillen Jr., murder-country duo the World Famous Crawlspace Brothers, and many more." Long-running rock outfit Ashtray Boy doesn't play too often these days, due to half of the band living in Australia, so catch them in town while you can. "Singer-guitarist Randall Lee and singer-bassist Carla Bruce-Lee live in Melbourne, Australia, so their bihemispheric band Ashtray Boy only plays here on the less-than-annual occasions when they come back to the midwest to visit family. But during those visits, the group’s Chicago version—anchored by drummer and former Reader contributor J. Niimi—reliably springs back to life to play tunes whose mixture of bemusement and open-hearted sentiment recalls the Modern Lovers. The lineup this time also features Scotland Yard Gospel Choir bassist-guitarist Mark Yoshizumi and J. Davis Trio trumpeter Dave Winer (who also backs children’s-music star Justin Roberts), and they’ll roll out some new tunes alongside old chestnuts such as 'Shirley MacLaine' and 'Observatory Hill.' Some of this material appears on the rarities LP Together (JellyFant), Ashtray Boy’s first release in seven years, and some comes from recent recording sessions." Local noise rockers Making Ghosts will be appearing at the Empty Bottle on Friday. Kevin Warwick says, "Chicago four-piece Making Ghosts aren’t putting up a front. 'We make noise rock,' they declare on their Facebook page, and their logo incorporates what looks like a diagram of the wiring inside a Big Muff—the almighty, burly fuzz pedal immortalized in the title of Mudhoney’s first EP. These dudes drop cinder blocks of chugging, evil guitar noise atop stomping, swinging drum rhythms that lean hard on the crash cymbals. The first half of their only release so far, the 2011 EP 001, contains the highest concentrations of metal-inflected heaviness—the later songs dip into more experimental postrock territory, with wan clean vocals instead of red-eyed screaming." Drummer Ted Sirota is a jazz man gone reggae. Peter Margasak says that Sirota's always played with an international flair, but his newest group, the Heavyweight Dub, goes full-on. "Drummer Ted Sirota is a fixture on Chicago’s jazz scene in large part thanks to his tenure in organ combo Sabertooth, which has held down a late-night gig at the Green Mill for two decades. But in his own long-running Rebel Souls, Sirota has often displayed a love for styles far afield from Sabertooth’s postbop: reggae, Afrobeat, Brazilian pop, even punk rock. For him, what connects those styles is the spirit of protest wielded by some of their heaviest hitters—Bob Marley, Fela Kuti, Caetano Veloso, and the Clash, for example. Early this year he formed the reggae combo Heavyweight Dub, which balances outraged, insistent revolutionary songs against tunes that favor rootsy ebullience. For the band’s debut album, The Scientist Meets Ted Sirota’s Heavyweight Dub (Liberated Zone), Sirota enlisted producer and King Tubby protege Overton H. Brown, aka the Scientist, to dub out his original tunes, which include instrumental salutes to reggae greats ('Tubby,' 'Jackie-Me-Too!') and politically charged rockers such as “Stop and Frisk (The New Jim Crow)” and 'Saro-Wiwa.'"